Following the advices and support from the Developer, this software is simply astonishing! Very well done and crafted. The Developer, for sure, masters the guidance and principles of BW´s. Congratulations, Mr Gennadiy! Супер функциональный, упрощающий торговлю эксперт! Всем советую! Торговая панель оптимизирована для работы с 2009 версией терминала МТ5 и выше. 1. Fixed the algorithm of waiting for an order activated by the zone signals. Now canceling an activated order for entering a position according to the Green (Red) Zones signals occurs after the color of the histogram is changed by the AO or AC indicator to the opposite one, once the period is closed. 1. Improved the "Change Trend" trade signal. 2. 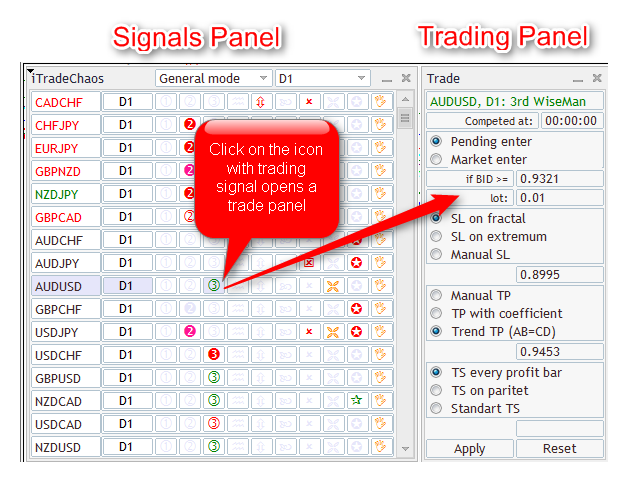 Added the "Cross AO" mode for selecting trade signals. 3. Added the autotrading mode. To activate it, set the Allowautotrading parameter to True. 1. 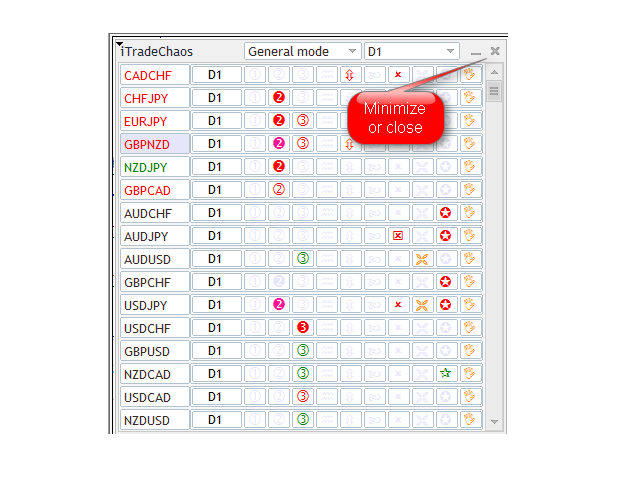 In the panel settings, added the option to set the initial stop loss when opening positions by "close" or by "touch". By default, it is set to "by touch". In the previous version, this feature was only available when double clicking the "Stop loss" line. 2. In the settings, added the ability to set the ratio of take profit to the possible stop loss, which is displayed in the trading area of the panel. Default TakeProfit coefficient is 1.62. 3. Added mode for selecting the "BW Zone" zoning signals. 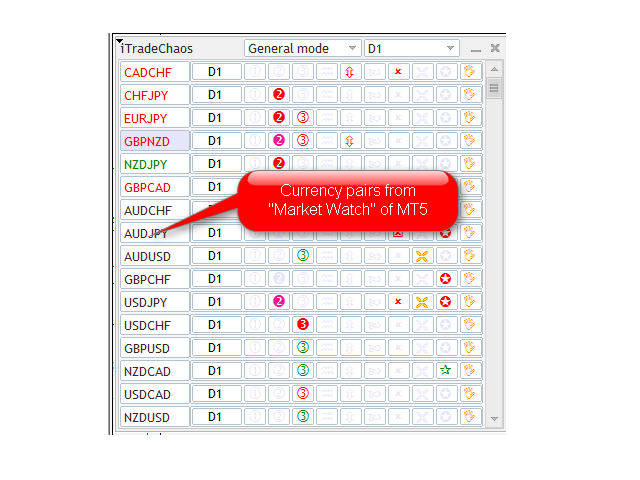 Added the ChangeTrend_Bars parameter (default is 10) - limit the depth of searching for "Change trend" trading signals. If set to 1, only preliminary signals as well as the ones formed on the last closed bar are displayed. Improved the algorithm of searching for the "Change trend" trading signal. In the updated version of the trading panel, the signal is considered formed when there is a fractal breakout, confirmed by the Close on a period higher than the fractal level. 2. Modified algorithms of "The beginning of the green (red) zone" trading signal. Namely, the buy condition is not only a "bullish" status of a bar, but also its close price above High of the previous bar. For sell signals, the bar should be "bearish", and its close price should be below the Low of the previous bar. 1. Modified the "Channel breakout" trade signal. Now, it is not based on the MultiRange_PCH indicator, but on the values of the Bollinger Bands and Standard Deviation (StdDev) indicators. 2. Modified the search algorithm for the "Change Trend" trade signal. In the updated version, the trade signal indicated an earlier broken fractal, which will be a key support or resistance level for the panel to place pending orders until the trend direction changes. 3. 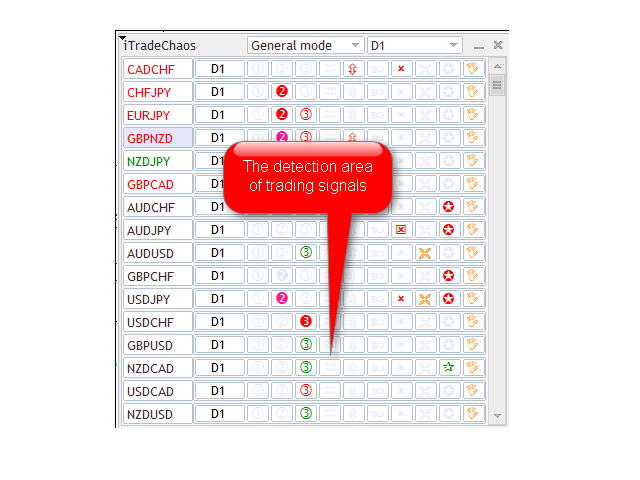 Improved the algorithm for determining the display duration of the trade signals in the "General mode" and "Autoactivation" modes. In the updated version of the panel, the specified modes show only the trading instruments, which have an impulse price movement before the start of its exhaustion. Enhanced the search algorithm for trade signals about formation of a local extremum. Improved the reliability of the trade signal by using an additional filter. Optimized the expert panel code. Improved the "Change Trend" signal. Integrated an additional reliable filter, which allows to eliminate the occurrence of false signals about change of the market trend, that are not confirmed by the price momentum. Improved Local Extremum Push-signals. Similar to fractal signals, the trader can now enter the market on the latest and pre-latest signal. The Gator signal has been replaced by the Fractals signal, the icon has been changed to the right arrow icon. The “Gator mode” has been changed to "Fractals mode", it displays all instruments which have a non-broken fractal. The signal itself is the last up or down fractal. The fractals, that have been subsequently broken by the price, are not displayed. - clicking its name in the trading panel alternates between the upper and lower fractals if they are both present on the chart. Which is a certain kind of the fractal analysis. You can manage them in trading with autoactivation mode. Custom settings have priority over the default ones. 2. Fixed periodically recurring error that occurred when setting a stop loss level for positions opened by push notifications. 3. Fixed a grammar error in the panel's interface. Improved search of price deviation limits on the chart. 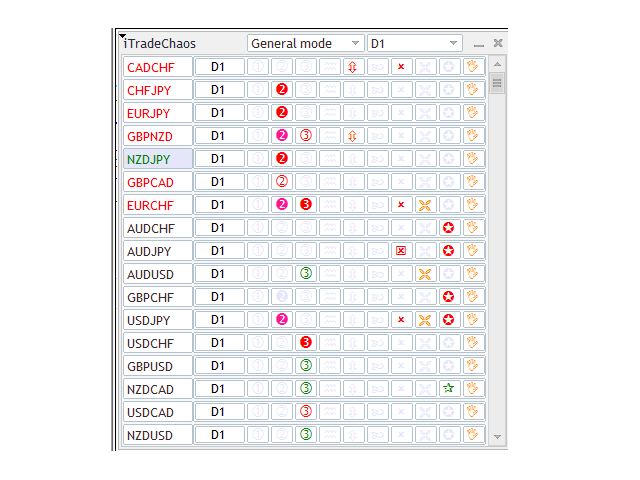 Changes in models library of local minimums and maximums, called "Push-signals" in Trading Panel. Improvements in local lows and highs search. Extension of push-signals library. 1. Improvements in local lows and highs search. Extension of push-signals library. 2. Improvements in search of divergent bars. 1. Improved algorithm of determining the moment of a trend change. 2. Improved algorithm of determining the breakеркщгпр of a fractal which indicates a possible change of trend. 4. New function has been added which displays potential profit (based on account currency) on the lines with the parameters when you place your pending orders. 5. Overall optimization of the expert. - Increased the speed of the panel performance. - Improved the function of detecting divergent bars (bdb). Fixed a bug panel relationship with Fractal breakout level and Qautoactivation indicators. 2. Added "Change trend" signal to the panel. The signal is based on a breakdown of fractal level and setting a limit order on it. 3. 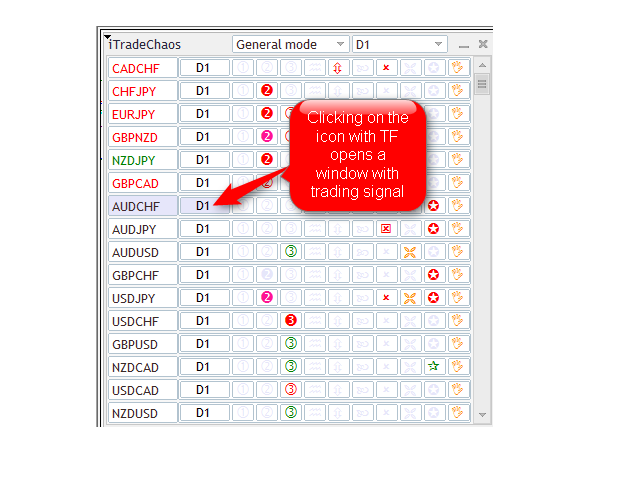 From now on, there is a possibility to choose "favorite signals" in the settings to be displayed in the panel. The expert is refined. From now on any signal (including "hand") can be used in limit-order type. To set a limit-order, you need to drag the buy-order line below the current price (sell-order above the price level), after pressing Apply button the expert will set a limit-order. There will be a line in the journal informing that you have activated the limit-order. With manual limit entry the trailing will stop working. It will also be mentioned in the journal. All the other signals with limit entry will have trailing working as usual. 1. Specified stop loss setup level for Push-signals. 2. Specified the lot size calculation for Push-signals. 3. Improved algorithm of fractals with autoactivation selection. 4. 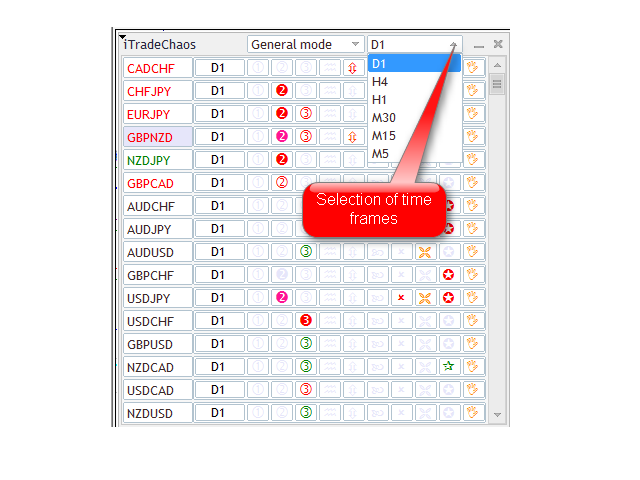 New function has been implemented - a possibility to trade a random timeframe with any trading instrument from Current Chart mode. From now on, a trader can activate a signal in Current Chart mode on any timeframe to activate a trading algorithm in General Mode. 5. Optimized the panel operation to the new MT5 releases. The new release provides a configuration library of divergent bars. Also, the push-signals filtration has been improved within autoactivation zone. The Expert Advisor`s work has been optimized considering the new versions of MT5 program. 1. Divergence signal is changed improving the algorithm of waiting for entry or order cancellation. 2. 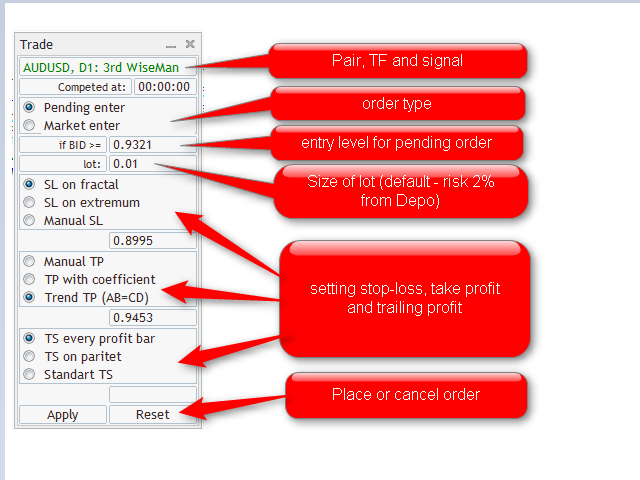 1 WM signal algorithm is improved, improving the algorithm of waiting for entry or order cancellation. 4. Stop-loss algorithm is changed. Now stop-loss is set on the touch of the price , but not on the closure of the bar. Double click on SL-line will change SL into a closure-bar mode. 5. The algorithm of "Autoactivation" signals is improved. By clicking on the timeframe button and then pressing "Apply" the EA will set pending order on breakdown of filtered fractal level. Then, if the Push-signal arrives in "autoactivation" zone, the EA will set a pending order on this signal bar. In case of entering the market, the EA will set TP, SL and then make a breakeven. Afterwards, there will be an add-on trade on the breakdown of the fractal and a double trade trailing on every profitable bar. 6. The main improvement is the possibility to trade in the multitimeframe mode. 1. Third Wise Man's (blue highlight) signal is canceled by the line having another color rather than by qNew line's disappearance. 2. Changed autoactivation signal: timeframe is highlighted only if the Third Wise Man's active signal in the appropriate direction is present (not passed and not canceled fractal). 3. ChangeTrend signal replaced by Push signal: it is LocalExtremums indicator arrow matching the autoactivation signal by color. The signal is canceled if the signal bar's Low is breached or qNew line is broken. The signal is quite rare, so it is difficult to check it thoroughly. Caution is advised when trading on a real account. 4. Added ability to specify the custom list of working symbols - "Custom symbols list" (comma separated). This version has been developed specifically for expanding the series of software products, including preparations for publication of the cheaper Trading Chaos Expert Lite expert panel. New signals for autoactivation mode. New fractal signals in "Saddle points" have different colors (deep red and blue). 1. Updated autoactivation file has been compiled in the panel for the perfect reliability of the Panel-expert. 2. Previously released Short Term HIGH/LOW indicator has been integrated into the panel (to see the signals on the chart, download it in the Market and attach to the chart). If a signal of forming a local extremum appears, the frame encircling all signals in the table is highlighted. Thus, trader's attention is focused on the signals directed towards Short Term HIGH/LOW indicator's signal. - Changed the trade signal Fibo_Strategy to a more effective called Change Trend. - Optimized default parameters of the Expert Advisor for the convenience of using. 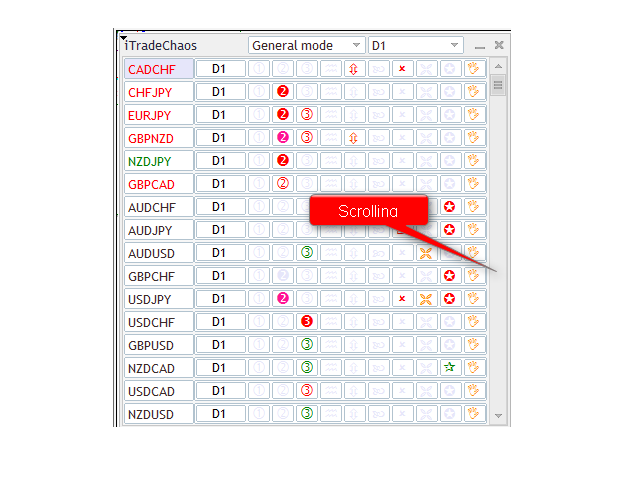 Added the possibility to use mouse to move virtual order used to enter positions, stop losses and take profits according to preliminary trade signals. 1. 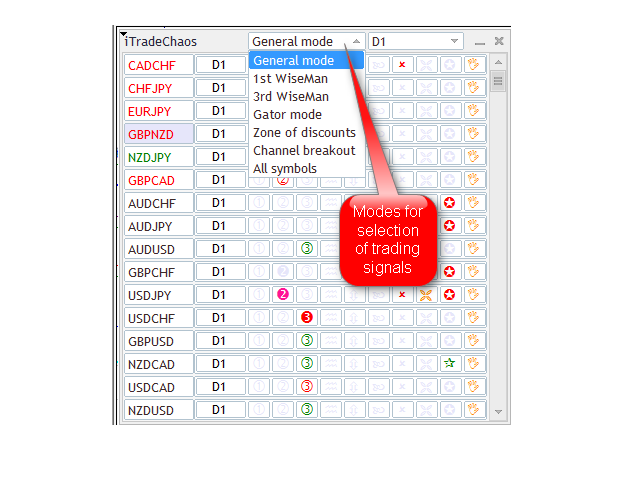 For more convenient trading a separate Autoactivate mode is added. It groups momentum signals for automatic trading on a selected timeframe. Light-green fill colors of the timeframe means that the instrument is in a upward momentum wave and it should be bought. Light-red fill colors of the timeframe means that instrument is in a downward momentum wave and it should be sold. 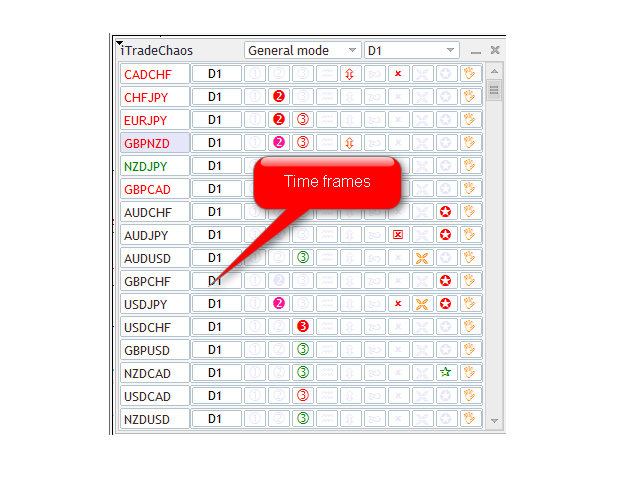 A click on the timeframe opens a trading panel with selected direction for trading in Autoactivate mode. A trader should just click the Apply button and the Expert Advisor will start tracking a possibility to enter a trade at the first signal in the direction of the momentum. The EA will stop tracking it when AO indicator closes behind the zero line on the side opposite to the trend direction, because it indicates a weakness of the market or a trend change. If you look at the signal table, you can clearly see which instruments have momentum and what is its direction. When a momentum is formed, in addition to the color change in the signal table, a trader is informed about it via email. 2. When the EA works on timeframes lower than D1, a fixed lot value is used instead of the value calculated on the basis of risk percentage. On smaller timeframes the lot of the last deal is used. 3. Standart TS mode of the profit trailing is changed to "Break Even". 4. The limitations which should decrease the risk of trading operations are added to the algorithm of the EA. The EA will not allow traders activating trade signals for entering the market and will not allow entering new positions if the Margin Level is less than 100% (percentage can be set by the trader). There were situations when a trader activated the signal, and the signal didn't trigger at the proper level due to not having enough margin to enter the position, however it entered the market at an improper level once the margin appeared. 1. Enhanced the algorithm of searching and displaying the "Saucer" signal. The EA signals about the momentum changes in a correction wave and a pair starts trending. The signal has become more qualitative and now it is moved to the "General mode" as one of the signals for entering a position - on the same level as "Three wise men", consolidation channel breakthrough and crossing the zero level with the "special blue light". In addition, virtual pending orders are now placed better than before. An order placed according to the "Saucer" will be canceled only if the momentum has changed to opposite of the histogram has crossed the zero line in the direction opposite to the estimated entry. 2. 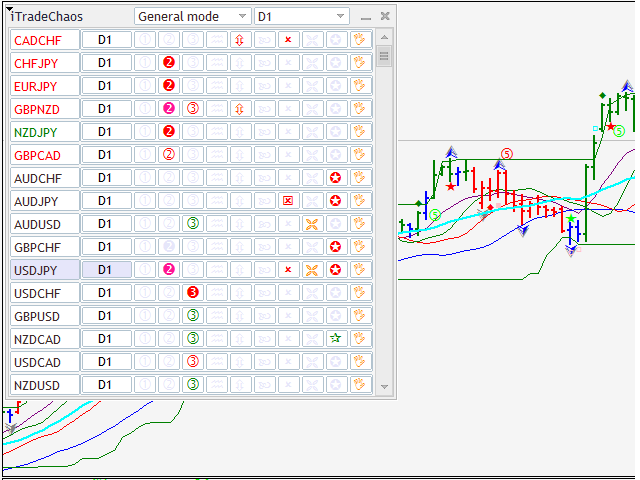 Added "Castum Chart" mode that allows trading with a specific pair in a separate window with a necessary timeframe. This version introduces additional filter used when searching for fractal signals. Now fractal signals are more effective and qualitative.